The Atlanta area has much to be proud of, though it might not be obvious from the attitudes exhibited by many of its most prominent citizens. For years, local planners and business leaders have regularly trekked to planning’s Holy City (Portland) in hopes of replicating its principles in Atlanta. They would be better saving their air fares. Money Better Spent by Government than People? Most recently, Jay Bookman of the Atlanta Journal Constitution wonders whether taxes are high enough in Georgia and seems envious of the fact that Oregon’s voters approved tax increases in a recession, despite months of having one of the highest unemployment rates in the nation. Perhaps they were naïve enough to believe that the higher taxes would not stand in the way of attracting new business to the state. Or, perhaps the voters believed that, as a neighbor to basket case California, Golden State businesses might still flee to Oregon as an expensive but less congested environment (Note 1). Portland Transit: Nothing to Emulate: Bookman is also envious of Portland’s transit system with its light rail and commuter rail. Perhaps he is unaware of the “pecking order” of transit. Atlanta’s MARTA is superior to Portland’s MAX light rail in virtually every respect. 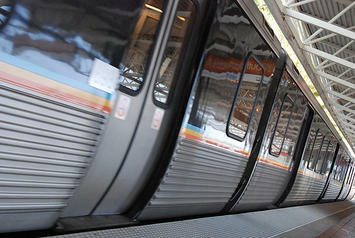 MARTA a world class Metro. It is fully grade separated and averages about 70% faster than MAX, which is a revival of abandoned streetcar technology. It is thus not surprising that MARTA carries three times as much passenger demand as MAX, despite a total route length approximately the same as in Portland. Despite MARTA’s superiority to MAX, both the Atlanta and Portland transit systems share the transit curse of excessive costs. Atlantans are paying far less to subsidize their transit system than if they had unwisely, like Portland, extended it and taxed residents throughout the suburbs. Portland’s Embarrassing Commuter Rail Line: And, commuter rail does not appear to be a matter of pride in Portland at this point. Portland’s one commuter rail line celebrated its first year anniversary recently. Before the line opened, Tri-Met transit officials estimated that the line would “have 2,400 riders a day as soon as service begins.” The Wilsonville to Beaverton WES commuter rail line, however, never came close to that number. Daily ridership has been under 1,200. But the relative paucity of riders did not interfere with the transit agency’s spin and the media’s general sheepish agreement. At the one year anniversary a Tri-Met spokeswoman commented that “When you think about having 55,000 jobs lost in the region, that translates into fewer transit riders throughout the system and particularly during rush hour.” However, nowhere near the half of riders that failed to show for WES cannot be blamed on Portland’s high unemployment rate. If Portland were to return to unemployment levels of a year ago, WES would likely add no more than 50 daily riders. So, recession-ravaged Portland has built a commuter rail line that carries, at best, 0.5% of the capacity of adjacent freeways when it operates. Moreover, it has been costly. The line costs about $60 per passenger, only $2.50 of which is collected in fares. This means that the annual subsidy per passenger is nearly $15,000, almost enough to pay the annual mortgage cost on two median priced Atlanta homes. Portland Traffic Congestion Worse than Atlanta: Atlanta is renowned for its traffic congestion, which is a direct result of its failure to invest in the type of arterial grid that could provide substantial relief for its less than robust freeway system. Yet, based upon the latest Inrix National Traffic Scorecard, (GPS collected data for 2009), there is less peak period travel delay (as measured by the Travel Time Index) in Atlanta than in Portland, which is a reversal from data earlier in the decade (see note). Atlanta: Adding a New Zealand: Atlanta has no reason to look to Portland as a model, or anywhere else, for that matter. Coming out of World War II, the Portland metropolitan area was larger than the Atlanta metropolitan area (1950). Since that time, Portland has grown strongly, adding 1.5 million people. Atlanta has added more than three times as many people. The result is an economy that produces at least $150 billion more in wealth every year than Portland. Thus, the difference between Atlanta and Portland is more than the gross domestic product of New Zealand. For at least the last two decades, Atlanta has been the fastest growing large metropolitan area in the high-income world. Atlanta: Land of Opportunity: But perhaps the biggest draw about Portland for Atlanta leaders is its “growth management” (so-called “smart growth”) land use policies. Portland has drawn an urban growth boundary around its urbanization. Its land regulators commission “sun rises in the West” studies to deny the fact that this rationing of land increases house prices. There is, however, no question of the impact of more restrictive land use policies, from the World Bank to members of central bank boards to decorated economists such as Kat Barker of the Bank of England and Donald Brash, former governor of the Reserve Bank of New Zealand. The result is superior housing affordability. Late in the year, the median house price in Atlanta was 2.1 times median household incomes (the Median Multiple). By comparison, the Median Multiple in Portland was 4.2, indicating that house prices are twice as high relatively speaking in Portland. In 1990, before Portland implemented its more stringent smart growth policies, housing affordability in Portland was about equal to Atlanta. But there is more to the story. Portland’s heavy handed planning policies are distorting product offerings so much that only the richest can afford more than a miniature back yard. This is illustrated by the images of new housing developments below in the suburbs of Portland and Atlanta (below). Both pictures are taken from approximately 1,500 feet above the ground. In the Portland example, virtually on the fringe of the urban area (the next urbanization is at least 10 miles away); houses are stacked in at more than 15 to the acre, with just a few feet between the roof-lines - vaguely reminiscent of third world shantytowns (Note 2). The more traditional suburban development that characterizes most of Portland is also shown on three sides of the overly dense new development. In the Atlanta example, houses have been recently built at about 4 to the acre, which has been the American suburban norm (except where land use regulations have required larger lots). The emerging sameness of Portland’s housing gives new meaning to the “ticky tack” criticism of suburbanization. Our 6th Annual Demographia International Housing Affordability Survey found Atlanta to be the second most affordable metropolitan area with more than 1,000,000 residents and the 17th most affordable metropolitan area out of 272 markets in six nations. Portland ranked 180th. Atlanta is truly a land of opportunity for young households and lower middle income households that can never hope of owning their own home in Portland’s pricey, growth management driven market. Rather than being a shameful example of metropolitan disaster, Atlanta remains one of the diminishing number of American urban areas where the American Dream can still be offered at a price that middle income households can afford. Atlanta has also emerged as one of the world’s best examples of ethnic diversity, not only in the core but also in the suburbs. More than half of the new residents in the suburbs have been non-Anglo since 1990 in Atlanta, about which it can proud. Atlanta is inferior only in the quality of is public relations and self-understanding. It should be a required stop for planners from Portland and beyond, for remedial education on injecting humanity and aspiration back into urbanization. Note 1: Bookman also notes in his column that Portland’s traffic congestion has not worsened at the rate I predicted in a 1999 Atlanta Constitution oped. I had not anticipated the huge gasoline price increases, which have materially reduced the rate of traffic growth virtually everywhere and made previous congestion increase rates unreliable as predictors of future growth. Note 2: For example, see the similar rooflines in a Dhaka shantytown near Gulshan at 23:47 North and 90:24 East in Google Earth. The principal difference in roof lines is the Dhaka slum’s lack of streets and cars, both of which seem consistent with the anti-mobility stance of “smart growth” planning. Submitted by ymouel on Mon, 05/25/2015 - 02:22. I like this new discovery. I hope you like it too. Just be consistent Okay? Submitted by ENGD on Wed, 03/04/2015 - 16:55. Submitted by ENGD on Wed, 03/04/2015 - 16:19. Submitted by ENGD on Wed, 03/04/2015 - 15:34. Submitted by ENGD on Wed, 03/04/2015 - 14:02. Submitted by boxerrulz1234 on Wed, 03/04/2015 - 13:17. Submitted by ENGD on Wed, 03/04/2015 - 13:03. Submitted by boxerrulz1234 on Wed, 03/04/2015 - 12:26. Submitted by boxerrulz1234 on Wed, 03/04/2015 - 11:58. Submitted by ENGD on Wed, 03/04/2015 - 11:33.